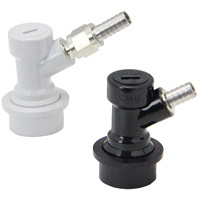 This is a set of two Ball Lock Home Brew Keg Connectors. This set includes both a gas in and beer out coupler that works with a ball lock Cornelius pepsi kegs. The Gas in features a 1/4" thread for a flare fitting. This connector already has attached the special 1/4" nut that has a 5/16" hose barb attached. The larger hose barb makes it connect to the same size air line that standard draft beer regulators use.